Iwikau Te Heuheu Tūkino III, paramount chief of Ngāti Tūwharetoa in the Taupō region from 1846 to 1862, was born late in the eighteenth century and, like his older brother, Mananui, whom he succeeded, became a renowned warrior at an early age. In January 1840, he travelled to the Bay of Islands with missionary Henry Williams to take part in the deliberations on the Treaty of Waitangi. Impressed by Williams' explanation of the Treaty, he and his companion Te Korohiko signed, although they had no authority to commit the tribe. When, several months later, a copy of the Treaty was discussed at Rotorua, Mananui repudiated his brother's action. But Iwikau's signature remains on the Waitangi copy of the Treaty. Iwikau became acquainted with Governor George Grey during his visits to Auckland and in 1850 undertook a journey with him from Auckland to his home at Pūkawa near Taupō. In recognition of his loyalty to the Queen, Grey presented him with a flag similar in design to that given to the northern tribes by William IV in 1834. During the 1850s, Iwikau sought both to restrain Māori protest and to support the growing grievances over the loss of land. Late in 1856, he convened at Pūkawa a meeting opposed to further land sales. An ardent proponent of Māori nationalism, he also encouraged the movement to set up a Māori king. He supported the installation of Pōtatau Te Wherowhero of Waikato as King at Ngāruawāhia in 1858. But when the Taranaki war broke out in 1860, he tried to prevent Ngāti Tūwharetoa from joining, fearing that the tribe's lands would be threatened. He died in October 1862. 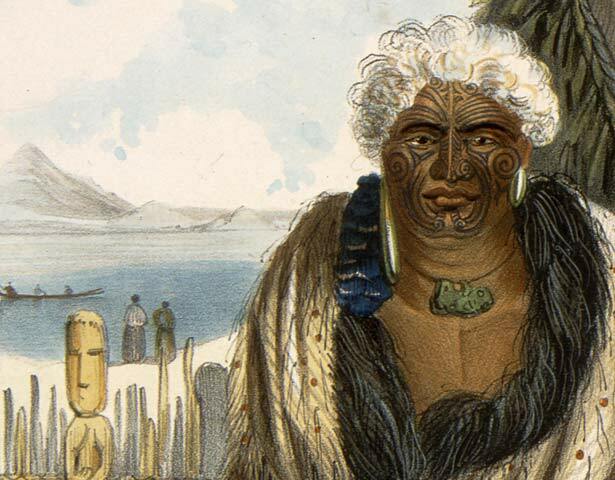 I whānau a Iwikau Te Heuheu Tukino III, ariki o Ngāti Tūwharetoa o Taupō mai i 1846 ki 1862, i ngā tau whakamutunga o te rau tau tekau mā waru. He toa tūtū taua ia rite tonu ki tana tuakana ki a Mananui, ariki o mua atu i a ia. I te marama o Hānuere 1840, ka haere ia ki Pēwhairangi i te taha o te kaikauwhau o Te Karuwhā, ki te hui nui mō te Tiriti o Waitangi. He pai katoa ki a ia ngā whakamārama a Te Karuwhā mō te Tiriti, ā, ka tahuri rāua ko tana hoa a Te Korohiko ki te haina, ahakoa kāore ō rāua mana haina mō te katoa o Ngāti Tūwharetoa. I ētahi marama i muri mai, i te whakawhitinga kōrero mō tētahi kape o te Tiriti i Rotorua, ka turakina e te tuakana e Mananui te hainatanga a te teina. Engari kei te noho tonu te hainatanga o Iwikau ki te kape o te Tiriti i hainatia i Waitangi. I whakahoa atu a Iwikau ki a Kāwana Hori Kerei i ana hāereere ki Tāmaki-makau-rau, ā, i te tau 1850 ka haere tahi rāua i Tāmaki-makau-rau ki tōna kāinga i Pūkawa, i te moana o Taupō. Ka whakawhiwhia a Iwikau ki tētahi kara, he āhua rite tonu ki te kara i hoatu e Kīngi Wiremu IV o Ingarangi ki ngā iwi o Te Tai Tokerau i te tau 1834, hei tohu mō tōna piripono ki te Kuini. I te tekau tau mai i 1850, ka anga a Iwikau ki te whakamāriri i te whakahē nui o te iwi Māori, otirā ki te tautoko i ngā whawhai a te Māori mō te ngaromanga o te whenua. Ka karangatia e ia tētahi hui nui ki Pūkawa i te tau 1856 ki te whakahē i ngā hoko whenua. He tino kaihāpai i te mana Māori motuhake, ā, ka tautokona hoki e ia te mahi whakatū kīngi. I tū ia ki te tautoko i te pōtaetanga o Pōtatau Te Wherowhero o Waikato hei Kīngi i Ngāruawāhia i te tau 1858. Nō te kānga o te ahi o te pakanga i Taranaki i te tau 1860, ka whakamātau ia ki te pupuru i a Ngāti Tūwharetoa kia kaua e whakauru ki te pakanga. Ko tōna wehi nui kei riro ngā whenua o tōna iwi. Ka mate ia i te marama o Oketopa 1862. We have 40 biographies, 12 articles, related to Iwikau Te Heuheu Tūkino III.